Some nice and much needed rain we are getting. Hopefully it all doesn't come at once and then stop. Last week I was in Pennsylvania and one day walking down by the Conodoguinet Creek by my dad's house where I almost always see some type of wildlife. I was treated to something new this time and made me wish for a bigger lens because they were not very close when I was able to capture them. 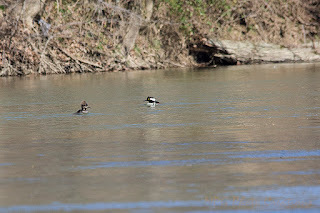 This is a female and male Hooded Mergansers that were floating on the creek. They had actually been closer at one point but I was not expecting anything to be right there and scared them off.